Do you think jewellery businesses need to up their games so that when consumers are looking for jewellery online they are going to jewellery-specific websites? NT: It all comes down to understanding the user journey because this is really important, but it is already quite complex and it will become more complex. It’s not like you discover a brand and go on the website and buy it. You see a brand, then you might see it again, then you look it up on Instagram, then you pass through a couple of different accounts, then you might see a pop-up, then you might want to meet the designer and feel the product, and then the actual transaction could occur in store or online, so do you attribute that sale to online or offline? It’s all jumbled up now. TI: You need to be consistent across all the platforms so that journey happens smoothly. RS: Jewellery traditionally is such an emotive purchase, that people do feel like if they are buying something fine or it is supposed to mean something, that they should go in a store and try it on. I think particularly for the industry there is a bit of a disconnect in that the jewellers in the most traditional sense who know their product and understand how to sell jewellery haven’t quite caught up with the tech types who are absolutely outstripping them in terms of getting in front of people. I think jewellers in the industry as a whole need to be more aware of where people are looking for things. I speak to a lot of retailers who are really resistent about being online because it’s this idea that if they set up an eCom site they will have hundreds of orders and they won’t be able to fulfil them, but it is actually a slightly different thing. If you have an ecommerce site it makes you seem bigger, it boosts trust. I think the industry just needs to be aware of bringing those two things back together to inspire the confidence to get people to buy online. People drop thousands of pounds on Net-a-Porter, so people are buying. The idea that people don’t buy luxury online is so outdated. We need to move past that and give the consumers the best experience. Glitzbox founder, Tamsin Ivy, believes jewellery companies need to focus on being quality where they are. NT: I feel a bit bad saying jewellers need to do this, or do that, because it is hard, especially for the start-out and medium type brands, but I feel like with fashion, where the whole industry is more consolidated, you’ve got big platforms like ASOS and then Net-a-Porter, and then big retailers with an online presence, but with jewellery it is a lot more fragmented. What happens is you have the likes of Richemont saying, ‘You can kind of buy a Cartier product online but we don’t really want you to, the experience isn’t great, what we really want you to do is go to stores’, then you don’t have that momentum behind it. Even Net-a-Porter, Far Fetch, the leaders in online luxury, I don’t know what the numbers are like but I think fine jewellery is a growing category for them, but it is probably incidental. Fashion is still the core. So you don’t have a go to destination, so to then ask all the jewellers to create a website and get online is hard. DS: There is JewelStreet, and the Jewel Hut, so there are lots of platforms out there that do specifically focus on jewellery. TI: But they are not as huge as the fashion ones and they tend to bring in other elements as well. It’s almost like they don’t get enough from just jewellery, so they are adding complementary things. NT: That’s interesting, so they are there, but they are not massive. Is it just that jewellery always had a natural lag to fashion? It will just happen but we are just lagging behind? What do you think are some of the misconceptions jewellery industry professionals have about being online? RS: The idea that people aren’t buying online is still huge, and also the idea that it is a huge time and money investment. Obviously that is part of it, but if you have a core of high quality content, it doesn’t have to be. We speak to people who say, ‘Well, we need to put three tweets out a day’. Well if you’ve only got 17 followers you don’t need to do that. You need to just pull it back and make sure you’ve got a decent amount of content that people are going to respond to and actually just go with that and build it up and start to see results. I think also, as we’ve touched on, because it is actually difficult to pinpoint exactly where a sale comes from, whether it’s a brick and mortar store, or if they have seen it on an influencer, or online, it shouldn’t be about tracking things, but because you can track everything on social people very quickly get bogged down on the number of followers and their engagement rates and things like that, and actually it’s a sort of reticence, because people don’t think it works, but these are the same people that will keep the back page of their local paper that they’ve had for the last 15 years, which is costing them £500 for example, and won’t change that way of thinking. So it’s just about saying, yes fine, you’re exposed to X many people, but actually if you took that money and used it elsewhere you could target exactly who you want to be speaking to and serve your brand to a more relevant audience. So I think the industry needs a bit of a re education about how communication is going. Digital is not going anywhere. There is still this feeling that it is a flash in the pan, and there is still a bit of a naivety about it, but it’s about jumping in and giving it a go. As newer online platforms, what are some of the challenges Banneya London and Glitzbox are currently facing? NT: There’s a lot of challenges and I am going to put my man’s perspective here, selling jewellery to women is complicated. Men are a lot simpler. I wonder if we should have done a men’s brand. Guys will go to Canary Wharf, or wherever they hang out, and say, ‘This looks cool, ok yeah I will take it’, and it’s job done. Women want to know what outfit it is going to go with, is a celebrity wearing it? Can they think about it and come back. We are in fine jewellery and it’s about trust. Convenience has to be there and it needs to be an easy process. You’ve got to have great press. You’ve got to be on social media with a nice presence that has the right kind of consistent imagery and that kind of thing. I can’t pinpoint it to one particular thing, really the challenge is meeting all those challenges at the same time. We are a small team but everyone is doing a lot of different things to get the whole package looking great, to capture that customer, to get them inspired, but also to get them to come back and convert. RS: I guess you have to be permanently prepared to innovate. There is always something new. People ask, ‘What’s the next platform?’, but no one knows. It could drop tomorrow. Lots of marketers are now chasing their tails about Snapchat, but it’s this kind of hysteria about what’s next. Facets PR digital comm manager, Rose Swingler, says its important for companies to find out what works for them – there is no ‘one size fits all’ solution. TI: And businesses are spreading themselves too thinly by trying to be in every aspect and every online platform, but it should be about focusing and being quality in where you are rather than trying to do everything. And it is does get distracting because you get opportunities and different things that might work, and even globally, like in China with the whole WeChat thing, there is just so much and so many directions you can go that you can end up not moving forward in any. And then the customer wants that one on one. They want to feel like they are talking to someone, so it’s making yourself feel approachable, but also big enough to be trustworthy. NT: That is a classic kind of thing in jewellery and luxury and fashion, people want that one to one relationship with a customer, but we find some customers want to be all on WhatsApp. They don’t respond to emails, but then the next person wants to see you. So you do have to be kind of ready with everything, but at the same time focus to the extent that you are not on WeChat if you haven’t got the time, there’s no point, leave it, or if Twitter is not for you, leave it. How can brands and retailers build trust online? DS: Consumers are knowledgeable about what attributes make a brand. For example the influencers are my press and they take all the photos themselves and it is in their style. That is my trust from a style point of view. Then there’s the application, so from a photography point of view, that is a massive thing, it needs to be accurate for the product. So I use styled photography that consumers can see themselves in. And then there’s being at shows and events, and being part of the communities that are relevant for your brand. So that adds more trust for consumers and perspective stockists. They want to see that I am relevant and in the right places, and aspire to be in the right places. TI: It’s about meeting all the different touch points, so for example when a consumer receives your product, it is packaged beautifully. Again, it is all about consistency. DS: It is all about the convenience as well and the whole sort of topic of convenience and shopping, and how revolutionised Click and Collect has become, who would have thought Click and Collect would be streets ahead? The whole point of online shopping is you don’t have to get out, but it’s convenient if they are out. And then Amazon are now at the stations because it’s convenient for people. I’ve had a lot of people saying they would like, for example, some nice tourmaline earrings but they’re not sure which ones they want so they ask to borrow them. If I was a shop I would say come in and see it, but if they couldn’t because they don’t live near the store, they still want to see it before they buy it, so how can you do that when you are remote? So there are various ways that I am going to be introducing such as paying a deposit, and using a courier. And actually that’s what’s really powerful about Etsy. See I started on Etsy, and what people love is the interaction and the fact it is personal, so most of my stuff is custom ordered. In that process you are polite, you are open, you give as many different personalisation options, you provide many different courier options, so you put convenience at the front. 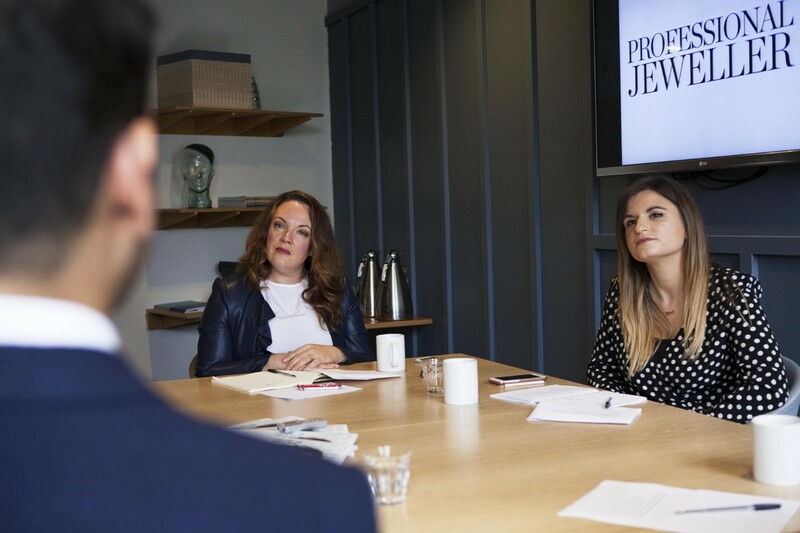 What’s one of the most important messages you think the jewellery industry needs to know about harnessing the power of online to boost business? RS: The most important thing we always say to all of our brands no matter how they are going about marketing themselves is to make sure you have your brand story online, and actually to pull everything back because we will have people come in and go, ‘We need to be on Facebook, we need to be here, we need to have a website’, then they are putting content up that is not relevant to their brand. We spend a lot of time saying if someone were to come and see you, what would you say about the product and how would you translate that? Because jewellery is an emotional purchase, it is something you buy because you like it and it is going to make you feel a bit special. It’s not the same as buying a jumper, there is something different about buying jewellery even if it is demi-fine or fashion jewellery, so we always say pull everything back, get your branding right and your story right, because I think as a consumer, yes you can go on social media, but if you’re fed advertising and selling spiel, you get a bit bored. You think ‘I’m not going to follow this, this isn’t actually engaging me’, so you just need something that gives you a bit of added value, so a story behind a product, or how to wear it, or how to style it, or something that brings a consumer in a little bit more than, ‘This is a ring, you can buy it here’. TI: I think designers are doing that a lot on Instagram — using it to tell their story. That’s what they’ve got that is different from huge brands, they can show elements being made, or how you would style it, and use Instagram stories to show live content as well. It doesn’t have to be super professional imagery but you can show your hand, you can show how it looks, and it makes it more real and that’s how you can have a strong online presence. You can have a really strong Instagram and then a simple buying system. RS: If you can see yourself wearing a piece you’ve kind won half the battle. In some ways would you say social media can be even more important than a website? RS: Yes, because you can have an ecommerce site, but equally someone might leave a message in an Instagram post saying, ‘Where do I get this?’, then you get that direct contact. They aren’t going to just go on your website. TI: It’s also automatic feedback in some ways. People will comment if they love pieces, they will tag images of other people wearing them, and it makes it feel like a real brand, because anyone can put up a website, and it doesn’t necessarily show that there’s quality or that you are guaranteed, if you are buying from a small, independent brand that you have never heard from, then you want that back up of some kind of social platform. DS: Instagram has actually helped me make my business, because I can curate how my business evolves faster on Instagram. So I want to be very fashion-led, and that helps me evolve then my website. So I can test things on Instagram and see if they are resonating. For example, I have been following Paris Fashion Week and saying there’s winter florals, I’ve got a floral collection, and seeing how people respond. TI: Do you ask questions and ask people for opinions as well? DS: The whole asking questions as a theory, ‘What do you think about A and B?’, the reality is no one really responds. Somebody has written a theory that the whole idea of social media is that it is conversational, but it’s not really being conversational anymore, it’s about being inspirational. NT: I keep seeing this company advertised at the moment called the Funky Iron company, a new type of iron that has Spotify built into it, and if you are selling something like that on the internet, then you can ask that question and get that feedback. But I think with anything that is fashion or jewellery, in that sphere where it is an emotional purchase, or an aspirational purchase, or a treat, it’s not about ‘do you like this?’ or ‘how much do you love this on a scale of one to ten?’ Instead, you want to have your brand story, inspiration and direction. DS: The other thing that is really important for Instagram, which has helped me to evolve the brand, is honing hashtags. It is honing which communities out of which hashtags that I think my brand is associated with and relevant for and needs to be associated with. So this whole ‘Made in London’ for example, I have had brands like Things from London, a new organisation who promote things happening in London, approach me, and they have introduced me to other brands, other platforms and other designers, just by hashtags. Also ethical and eco fashion. Some of my best stockists are luxury fashion and they have all found me through certain hashtags. So that has been surprising, and far more influential than I would have ever imagined. You can actually build a business through hashtags. Lily Flo founder, Diana Sherling, has had great success with boosting business on Instagram. NT: I think the other thing to watch out for in the near future is the changes that Instagram will make to their shoppable features, and I think everyone is waiting for it. They have started doing it with some brands in the States and I think they will broaden it out. TI: It is that element of being on different platforms, so Instagram and Pinterest, but actually doing it in good quality and taking that offline experience and translating it online. So you’ve got good customer service, you’ve got someone around to help advice, and you’ve got content as well. A lot of websites, they are just a website but actually to drive people back to the website and be interested there needs to be a lot more content around how you wear it, blog posts, interesting elements to the online that you can’t get offline. To conclude, could you share something you feel is going to be big in the next 12 months online, or reveal the number one lesson you have learnt this year about using the digital world to enhance your businesses? DS: For me, Instagram has been the most incredible learning journey out of everything. Not only from the content that I am curating and putting on there, but also the networking. This is possible partly through hashtags and partly through the imagery. And then stories and adding video to it as well. My bloggers and influencers have come to me from the stuff that I have done which is I think the right way round from a brand story point of view. But also I have had a lot of new stockists see me through honing out hastags, so that hashtag has a journey that then massively helps define my brand, and also helps me for search and SEO. NT: For us innovation is very important for us, it is one of our values because it is the way we differentiate, so we are looking quite a lot at the 3D side of products and understanding it. So we are introducing parametric design soon, which will add another layer of customisation, such as being able to, on the interface, move things around and change the shape, change the size of the diamonds and change little geometric features, but still done in a nice non-gimmicky way. Pushing more customisation features is part of our offering and I think that is where we want to be. All to assist in that whole user journey. It doesn’t necessarily mean that is going to bring more sales, it is about the engagement. There’s things to do here. Other brands may be focused more on the story but we look at innovation quite strongly so that’s on our minds. Looking ahead, Banneya London, will focus on innovating in the e-tail arena. TI: Something we didn’t really touch on much but I think fashion are doing it, it is this idea where when people go to your site they are getting a personalised experience. So they are shown things that they maybe like based on what they have bought before and I think data around that for jewellery is going to become more prominent. So, for example, if you don’t wear silver you are not going to be shown silver jewellery pieces. I think that will start to feed in a lot more and make the customer journey feel personal and bespoke and so conversion will hopefully be better because they are seeing things they actually like. So I think that kind of data will be used more for jewellery where it has not previously be used. RS: I just think there is really not a one size fit all solution for digital. Work out what is working for you. What’s going to happen is user experience is going to be at the heart of everything because as the bigger brands and the tech brands run away with making things absolutely personalised to you, keeping your consumer and what they want from you, keeping that at the heart of everything and just saying this is our mix, we are not going to sell from a website because it doesn’t work for us, so we are going to make our Instagram shoppable, or do this or that. It’s literally about finding out what works for you and not getting sidetracked by everything else that is going on and not worrying about the next thing. If something is working for you — work on that and refine it and develop it.